Toronto will soon be home to North America’s tallest architectural heritage retention development. Located on the northeast corner of University Avenue and Dundas Street West, the United Building will turn to a 55-storey high rise which will highlight the restored heritage structure of the storied Maclean Publishing Company/Maclean-Hunter Building at 481 University Avenue, and will add commercial and retail space from the ground floor to the 10th floor and new residences above the historic structure. The United design team includes B+H Architects as prime consultant and design architects; heritage consultants ERA Architects Inc. and Tomas Pearce Interior Design Consulting Inc.
Mark Berest, B+H Architects Principal said the design is a tribute to Toronto’s cosmopolitan character. The United includes 224,245-sq-ft of commercial office space and 39,320-sq-ft of retail space up to the 10th floor where the 759 residences units begin. 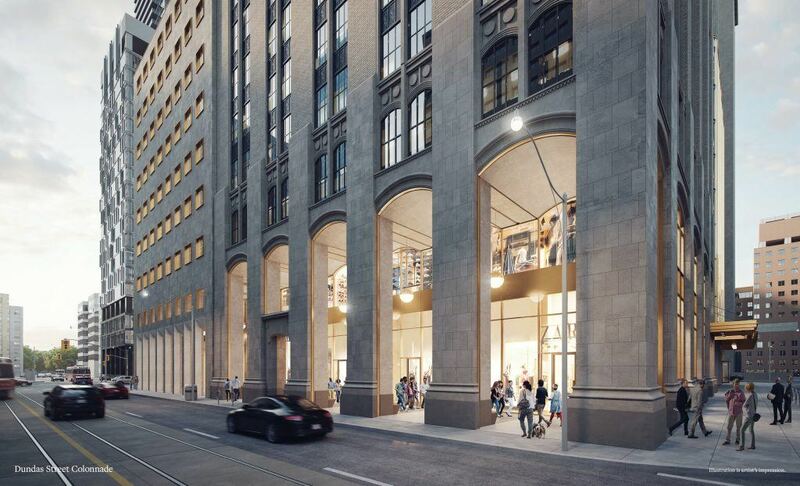 The front door to 481 University leads to the offices and retail; the residential condominium entrance will be at 88 Centre Street, offering direct access to the TTC’s St. Patrick Station from inside the building, according to Davpart Inc. The heritage work includes retaining, restoring and enhancing two large and significant buildings. The first is a 1930s collegiate gothic building by Toronto architect Murry Brown, designed with New York’s Schultze & Weaver. The second, designed by Marani & Morris architects is a midcentury example of modern stone office towers that contribute to the distinctive character of University Avenue, according to ERA Architects Principal Graeme Stewart. As for the residences, the United will include studio to one bedroom, two bedroom and three bedroom designs, some with a den, flex or media room; some will have two storey plans. Suites are said to be sized between 300-sq-ft to 1,400-sq-ft.
At this time, there is no scheduled date of completion for the project.